The company was officially started in 1988. 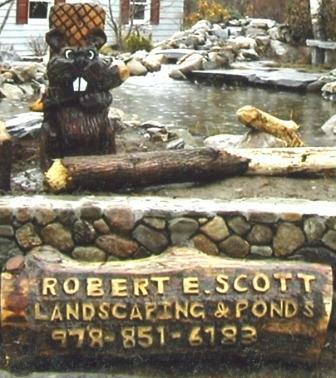 The owner Robert Scott had an interest in landscaping since he was a child. He was often seen going form neighbor to neighbor mowing their lawns. Around winter of 1988 the idea of starting a “professional company” hatched as a way to pay for college. Once the company started Robb changed his major from biology/pre-med to landscape design. Once that was complete Robb stayed on to get a degree in Arboriculture at Umass Amherst. Hence the love of landscape and learning continues. The company’s main function is design/build with arboriculture being a large part. As the company continued to grow and expand the need arose to maintain the projects that they build. That is where the maintenance and enhancement design started. It wasn’t enough to design and build a beautiful landscape if no care or upkeep continued. No matter how good the design is or how well you build it, it needs maintenance and care. Through the 1980s the love of water features and ponds were added as core functions of the company. Then came pond less waterfalls and a new division called Busy Beaver Ponds Design. This allowed the company to expand and also sub-contract to other companies but keep our own quality and integrity. The company mostly deals with residential projects large and small and deals with large commercial water features. As the company had done commercial snow plowing, commercial and industrial landscaping has begun to take off. We look forward to this new growth and all other services we provide. Our company has a family feel but also has the know-how to handle the largest jobs while not forgetting where we began.